It’s been six weeks of being back East in snow and freezing cold conditions which means we’ve had several days of having to stay indoors. This is a foreign and unpopular concept for Evelyn. As the terror of occupying a toddler for several hours indoors each day mounted, I’ve spent several hours scouring pinterest and instagram for ideas and activities to keep us occupied. Being unemployed and on a fixed income means I can’t keep buying her toys or paying for toddler classes so I’ve had to get pretty creative with what we already have. So today, I wanted to share with you Evelyn’s favorite everyday household items that she plays with more than her toys – and you probably already have all of these in your home! Paper Towel & Toilet Paper Rolls: These are GOLD. Don’t ever throw them out. You can use them to project your voice like a mega phone – add a towel around your necks as a cape and march around the house. put two toilet paper rolls together to make binoculars. Put two together and make a ping pong ball launcher. Make a DIY ball shoot (I used balled up aluminum foil). Paint them. The options are endless. Boxes: A justification for all those amazon deliveries mama! Also, save those diaper boxes!! I’ll use smaller boxes as oversized “blocks” for tower building. You can paint them, use markers or (less messy!) crayons. 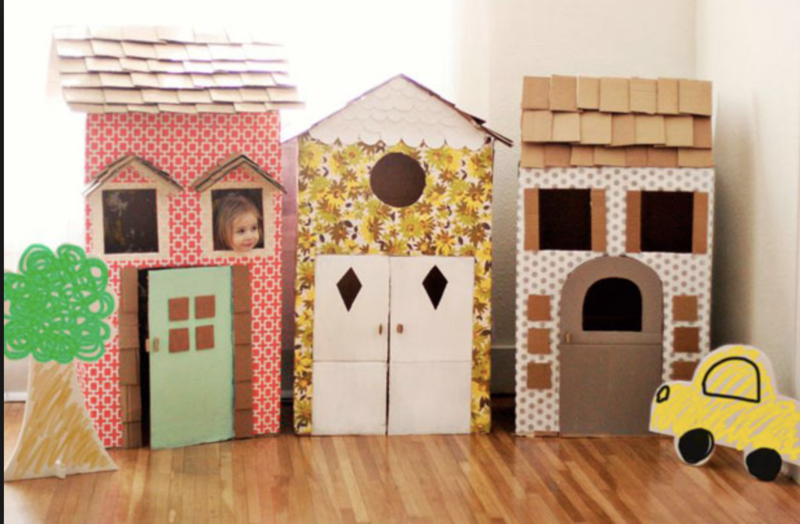 The larger ones can be made into forts or houses. We currently have two very large boxes that I’ve put together to make one big “room” with a blanket on top and a window cut in one side. Inside, I put crayons to color the walls and stickers. Empty Food Containers: Don’t spend money buying fake food packaging toys for your little’s play kitchen! We use the real thing – empty oatmeal containers, empty cardboard pasta boxes, cleaned out empty plastic food containers, etc. Empty Egg Cartons: So many sorting and color sorting suggestions online! Glass Jars: clean them out and let your little practice opening and closing lids and transferring small objects from one to the other. Sponge Play: Clean kitchen sponges (cut into shapes if you want to be extra) and a big bin or bowl with a little water. I buy them at the dollar store, also get the huge yellow “car wash” sponges. Uncooked (Penne) Pasta – I use this ALL THE TIME. Let them use uncooked penne pasta in their play kitchen, pour into a sensory bin (bonus: try this rainbow penne recipe. Looks like all you need is gel food coloring. ), or use to make a DIY threading activity for your little with pipe cleaners. Also, the hottest rainbow colored pasta trend at the moment seems to be rainbow colored cooked spaghetti. Tupperware Containers: Let them bang on them with a wooden spoon, give them objects to transfer from one to another, put little toys (that you already own) in them and let them try to get the lid off. Plastic Cups: Put your tupperwear and plastic cups in a cabinate or drawer that’s low to the ground that your toddler can access. Let them explore freely on the floor in the kitchen while you cook a meal. Your toddler can exploring building a pyramid, stacking the cups inside each other, or you can make it more challenging by putting a playing card or lid between each cup. Spice Jars: E is OBSESSED with spice jars, expecially salt and pepper shakers. But I don’t want to waste spices and it’s a mess! You can give them empty ones but obviously that’s less exciting. You can buy some at the dollar store and give them a huge bin to shake the spices into. A Spray Bottle: Give them a spray bottle filled with water or DIY non-toxic surface cleaner (water, vinegar, dr. bronner’s castile soap & essential oils) and a cloth/sponge/brush and let them spray down and clean furniture and surfaces around the house! Washing Dishes: Let them wash their own dishes. She LOVES it. Just make sure it’s lighter items that aren’t break/chip-able. DIY Playdough: made with flour, salt, water, vegetable oil & food coloring. Grab some cookie cutters and a rolling pin. Or some toy animals for farm (green playdough) or water (blue playdough) animal creative play. Any go-tos that I missed that your little loves?? Let me know in the comments below! If you try any of these out post them to instagram stories and tag me so I can see! Subscribe so you never miss a post! Don’t miss a post! Subscribe to the mailing list. © 2019 Maria Pelletier. All rights reserved.